John Reist came to Williamsville in 1808 and bought a farm of 196 acres, extending from Mill Street almost to Reist Street. His brother-in-law, Abraham Long, bought the property facing Reist Street and, in 1821, a flour mill for the Reist Milling Company was built on the two properties, with the lot line passing through the center of the mill. The main building was destroyed by fire on July 19, 2008. Before the fire it stood on its original stone foundation. Preserved before the fire was the cupola, two dutch doors with long wrought iron strap hinges and their original latches and locks, much worn floor boards and octagonal shaped walnut posts that supported the loft. One of the bearings for the 12-foot wooden overshot water wheel was visible and the topography of the area reflects the millponds, the mill race to the wheel that passed under a bridge at the side of the mill and the raceway that led to Ellicott Creek-near the present fifteenth tee of the Park Country Club. The mill prospered and expanded. On a map of John Reist's farm, drawn by his grandson Warren D. Reist, are shown the following: Grist and flour mills, hemp mill, saw mill, mill barn, several mill ponds and embankments, cooper shop, the large farm house, a two-family mill house and a tenant house for saw mill and farm hand (where the Jerry Shiesley family lived). There was also a teamster's dwelling, carriage house and sheds for ox and horse teams. A road ran from Reist Street at the mill, across the entire farm to Mill Street and there was a proposed Elm Street, to parallel Bear Street (Glen Avenue) from Reist Street to Rock Street. In 1830, John Reist became a preacher of the Reformed Mennonite Church that is still in existence at Main Street and North Forest Road. He leased the mill and, with his son Christian as a partner, became involved in several financial investments. They bought stock in the Lake Navigation Company, an interest in the Hollister Grain Elevator, a steam boat to sail on Lake Erie and a scow for use on the Erie Canal. They purchased wheat in Detroit, shipped it to Buffalo on their own boat, hauled it to the mill, ground it into flour and then shipped it to New York in their own scow via the Erie Canal. John Reist loved his church more than money, so in 1846 he and his son sold out their stocks and took over management of the local mill. They immediately hired Reuben Lintz to enlarge the mill and install a second water wheel with a roller system to supplant the original two-stone system. Now Grade A flour could be made. John H. Kline became millwright, engineer, mechanic and superintendent of all carpenter work. Soon the mill was producing 100 barrels of flour a day besides grinding rye, buckwheat and "custom feed." Two grades of flour were manufactured and sold under the brand names of "Golden Eagle" and "Arlington." In 1868-70, the water supply became inadequate. A large dam was built across Ellicott Creek, just to the north of the bridge on Glen Avenue. 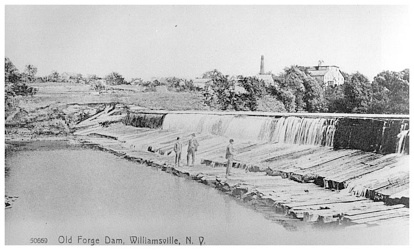 While it belonged to the Reist Mill, the dam became known as the "Forge Dam" because the Greybiel Forge was located on its banks. The raceway ran west to join the stream that still flows in front of St. Francis Home on Reist Street, to form a large mill pond. While the pond is no longer in existence, its contours, at the bend of Reist Street, are still obvious. One of the most ambitious ventures of its time, construction for the water supply cost $7,688.15. Included were $305 worth of water lime purchased from Benjamin Miller, $28 worth of sand from Gardner Green and $61 worth of sand from Lucius Bestow. The Uebellhoer quarry supplied six "cords of stone" for $10.50. More than 90 men were employed during the construction and wages ranged from $1 per day for laborers to $4 per day for experts. In 1870, the two over-shot wooden wheels were replaced by Laffel wheels and, in 1880, a steam boiler and engines were installed. The property was sold to Joseph Kuhn and Sons In 1893 and the mill was operated by them until 1903 when the entire plot was purchased by the Sisters of St. Francis. Amherst and surrounding areas experienced an influx of Mennonites from Pennsylvania in the 1820s. By 1828, Amherst Mennonites organized under John Herr, held services in held services in members‘ homes. 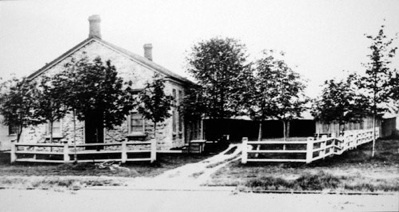 a limestone meeting house was erected in 1834, on the corner of Main Street and North Forest Road. John Reist, local businessman, served as pastor from 1836-1879. The building is now owned by the Town of Amherst. The last Mennonite service to be held in this building was in the 1980s. The Reist Mill, erected in 1821. 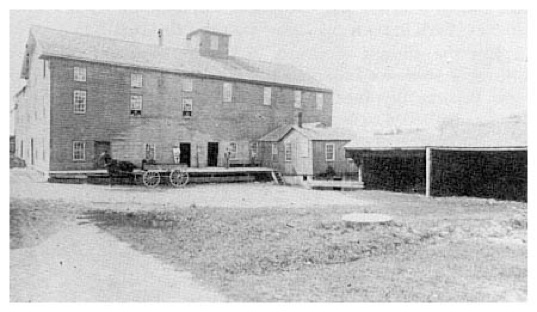 The first load of western wheat that was shipped to Buffalo via the Great Lakes was hauled here by ox teams and ground into flour. The main mill pictured at the left was used as a storehouse for the St. Mary of the Angels Convent. It remained in use as a storehouse by the Town of Amherst after the State of New York purchased the property for Amherst State Park. On July 19, 2008, it was destroyed by an arson fire. 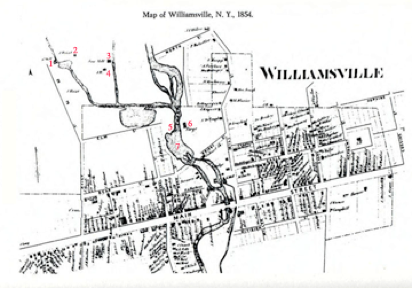 The map of the Village of Williamsville, 1866, shows some of the changes a century makes. Most of the streets remain in their original location and names; Canal Street became North Cayuga, Bear Street and Bridge Street combined to make Glen Avenue, Cossins Street became Rinewalt, Miller became Oakgrove Drive, and Division became Park. Hopkins Street no longer exists, nor does Hershey Street. Elm, North and Forge Streets were absorbed in the development of the Sisters of St. Francis purchase. 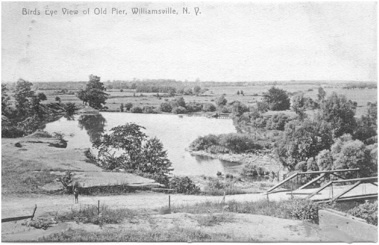 John Reist and his family were among the first settlers near the falls at Williamsville, where he bought 196 acres. A Mennonite and a veteran of the War of 1812, he was ordained a minister in 1836 and preached for 40 years at the Mennonite Meeting House, which was erected in 1834 and still stands today at the corner of Main Street and North Forest Road. 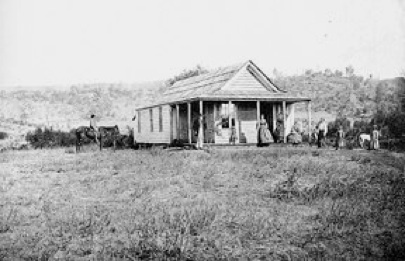 Shown here are the Reists in front of their of their early pioneer residence. 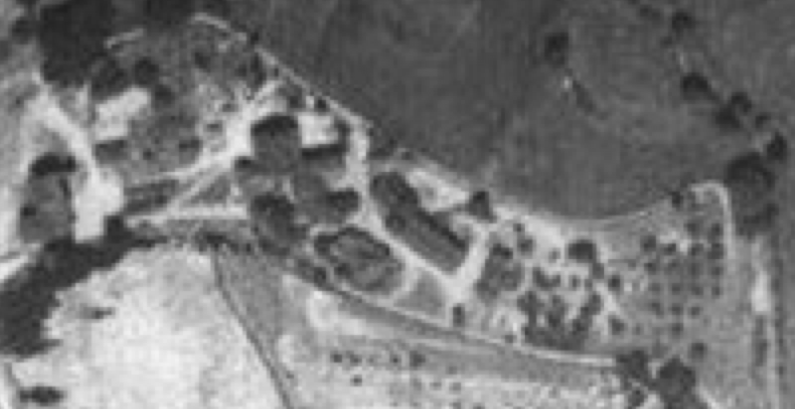 1927 aerial photo of the Reist Mill complex. The gold arrow points towards the location of the Reist Mill which was destroyed by a fire. The red arrows point towards the path that runs along the fence of the current Sisters of St. Francis Mother House property. The green arrows point towards some of the buildings of the Reist Mill complex.